Life on Sanibel Island is peaceful and relaxing. Discover the tranquility of the island. We spend the majority of our time on the beach. Whether we are walking along the water, sitting on our beach chairs, or taking a dip, this is where we like to be. The photos in this video are what we see! Most of the amazing dolphin photos were taken in November 2018 on the Sanibel Thriller. We highly recommend them. Enjoy! I just returned from a short trip to Sanibel. It looks like the island and the Fort Myers area is quickly recovering from Hurricane Irma. On the island, many branches and trees were lost, and there are a number of piles of vegetation that still need to be picked up. But the roads are open and it didn't look like any biking and walking paths were unaccessible. Most shops and restaurants are open or should be within the next few weeks, and the farmers market opened for the season yesterday (Sunday, October 1st). 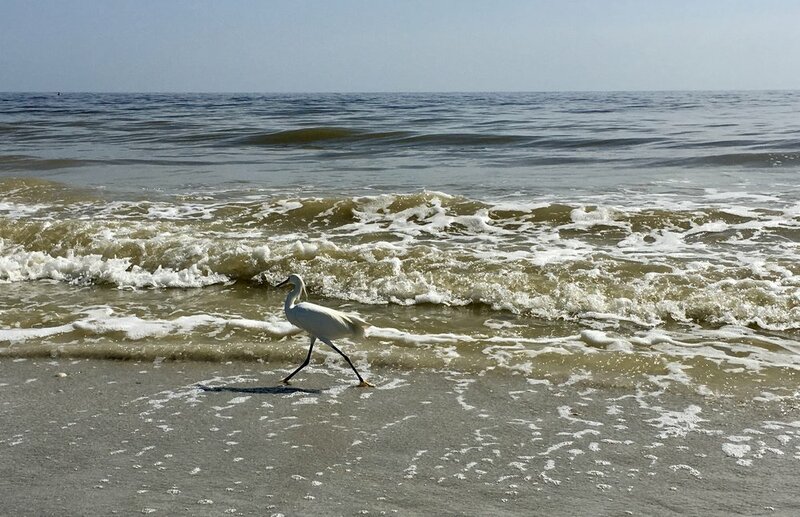 The gulf waters are warm and enjoyable for swimming, the birds still run away from the waves and there are plenty of shells to be gathered! As is usual in the fall, the island isn't very busy, but as we approach the busy holiday and winter season, don't forget you can use the Gulf Drives to avoid traffic. By following the West, Middle and East Gulf Drive, you can get all the way down to Pinocchio's Ice Cream and the Lighthouse Cafe without driving on Periwinkle. If you're spending time on Sanibel this winter, here are a few events you can take advantage of. First is the Clinic for the Rehabilitation of Wildlife (CROW) Speaker Series. These hour-long lectures occur about once a week through the end of April at the CROW Visitor Education Center. Some topics this year include talks on wildlife photography, the secret life of sand dollars, and other island wildlife like manatee and ospreys. Did you know the "Ding" Darling National Wildlife Refuge has many educational tours and programs? Take a beach walk, learn about endangered species or take a bird and wildlife tour. These programs are completely free, although there may be parking or entrance fees. They run through Easter, but I should point out the society also runs an abbreviated schedule during the summer. Check out their website for more details. Finally, the Bailey Matthews National Shell Museum conduct daily beach walks with a marine biologist. The walks leave at 9am from the lobby of the Island Inn, just a half-mile down West Gulf Drive from our condo. The cost is $10 for adults and $7 for children, but each participant will receive a 50% off coupon for the Shell Museum. Reservations are required. If you attend any of these activities, let us know what you thought about it!